Well, I had to get back in the woods today. I made arrangements at work yesterday to go in early and get out early. When I got out of work around 1:00 p.m., I figured I would have enough time to collect all of my cameras. I had four of them in this piece of woods. 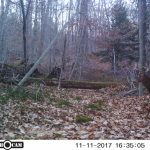 Although, I didn’t plan on hunting, I decided to sit somewhere if it caught my attention and said, “SIT HERE.” My main goal was to get the cameras out of the woods and to find two places to sit for the weekend, one for me and one for Dad. When I parked my truck and got ready to head into the woods, my buddy Doug and his son Jeremy pulled up next to me. We chatted for a bit and then headed into the woods. It was good to see Doug. He’s had a hell of a season. Earlier in the year, after his strokes, none of us thought he would be able to join us in the woods for hunting season. I was really glad to see him, and he looked good. After I got home, I saw on Facebook, where Doug had written a little think about how awesome it was to by with his boy………..a dad and his boy is how it started. I enjoyed it, and it made me reflect on some of the times Dad and I have gone into the woods with each other. I’ll probably write something in the next month or so about a boy and his dad, Doug’s words just struck a chord with me, so Doug, if you’re reading this, I’d just like to say thank you. By the time I came out of the woods tonight, I was confident in the places I had picked for my dad and I to sit this weekend. I’m not sure if we’ll see any deer, but we will give it our best and close the season out on Sunday. 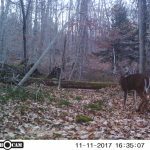 Although I was somewhat disheartened by the pictures on my cameras, I was excited about one of the bucks that made its way into the frame on one of them. I’ll probably sit in that area on Saturday morning. The deer have been feeding on acorns and beechnuts in the same bowl and there’s some good buck sign. I’m not sure if the buck is alive, because I only got one picture of it. I’m hoping that it made it through the gauntlet that the rut can produce at times, and he just chose not to walk in front of the camera again after he made his initial pass. Here’s a picture of the deer I’m after…………..if it’s still alive. This entry was posted on Saturday, December 9th, 2017 at 4:45 pm and is filed under Uncategorized. You can follow any responses to this entry through the RSS 2.0 feed. You can leave a response, or trackback from your own site.